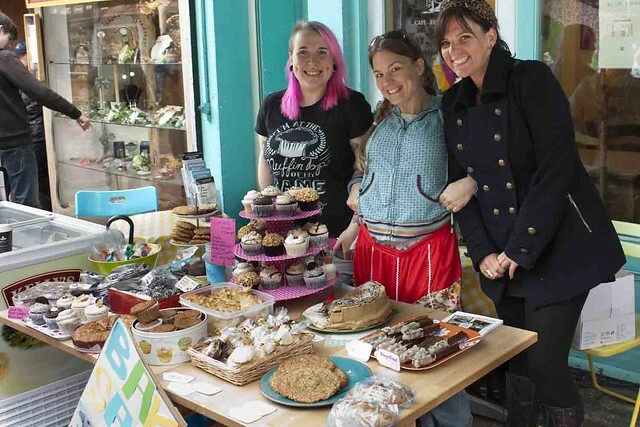 Brighton Vegan Bake Sale Success! First of all, a huge thanks to both everyone who came by and supported the cause and to the generous bakers who donated their time and efforts. It was a great day, a huge success, and we sold out completely by 4:30 in the afternoon. The total amount raised was £480, which will be split between Sea Shepherd and the East Sussex Wildlife Rescue and Ambulance Service. A great big thank you and shout out to Wai Kika Mu Kau Cafe in Kensington Gardens for generously providing the space for this charity fundraising event. They do a mean vegan breakfast, so if you’re ever in town and in need for a good meat free brekkie then I highly recommend you to check them out! We were selling by 10am, and immediately at a good rate. Goods for sale included a variety of cupcakes, including donations by the lovely Ms Cupcake and the Operation Icing not-for-profit business- raspberry, Earl Grey, Crunchie, peanut butter chocolate, and peppermint were just some of the flavours on offer. Along with cupcakes, Operation Icing also contributed agave banana breads, courgette (zucchini) muffins, brownies and more. My donations included giant peanut butter cookies (also popular), gingerbread biscotti, baked bean and cheezly pasties, gluten free chocolate chip cookies, and pressed Scottish shortbread. Donations from other local vegan bakers included chocolate cake, awesome cookies, a gluten free vanilla coffee cake, peanut butter chocolate banana bread, mini filo quiches, and chocolate oat balls (yes, I said balls). The day started out with a laugh when, quite early on, a charming youth paraded through the street in that pompous chav march (you know, the one that makes someone look like they’re packing blow up their bum and are walking on needles whilst trying to keep their 5-sizes-too-big tracksuit bottoms up). “I can bake better cakes than that,” she boasted as she walked by. “Why don’t you go home and do that then?” was our friend Holley’s response, to which the girl assured us she would. I hope I have the privilege of seeing her again in a few years’ time. Another bright spot in the day was a North Laines worker’s request for one of the “magical sticks.” In hindsight I should have just ditched the gingerbread biscotti tags and hand printed new ones. While there were still cupcakes available, a father stopped with his two girls. The younger daughter’s eyes grew huge as she stared up at the table of goodies, looking longingly as her father asked her whether she would rather have cake or sweeties. Naturally, being a smart kid, she was set on the former. He asked again to be sure, and she continued to insist on a cupcake. Behind the table we already knew the choice she’d made: surely she wasn’t the only one who could see the best of both worlds in the sweetie cupcake, an Operation Icing cupcake topped with sweets! Children are smarter than we give them credit for sometimes. A lot of people slowed down as they walked past, smiling and making a motion to their stomachs as they attempted to move on. “I’m on a diet” or “I’m stuffed from lunch” were frequent comments, but as soon as we implored them to have a closer look as it’s for charity nearly all of them came back. One woman’s response was a bright and cheerful “alright! Get fat for charity!” Personally I’m down with that slogan. “I like ponies!” was my contribution, at which point Jojo very encouragingly patted me on the shoulder and said I almost had the right idea. It was a brilliant day. Thanks again to all involved. Congrats to everyone involved. It looks like it was a great event.